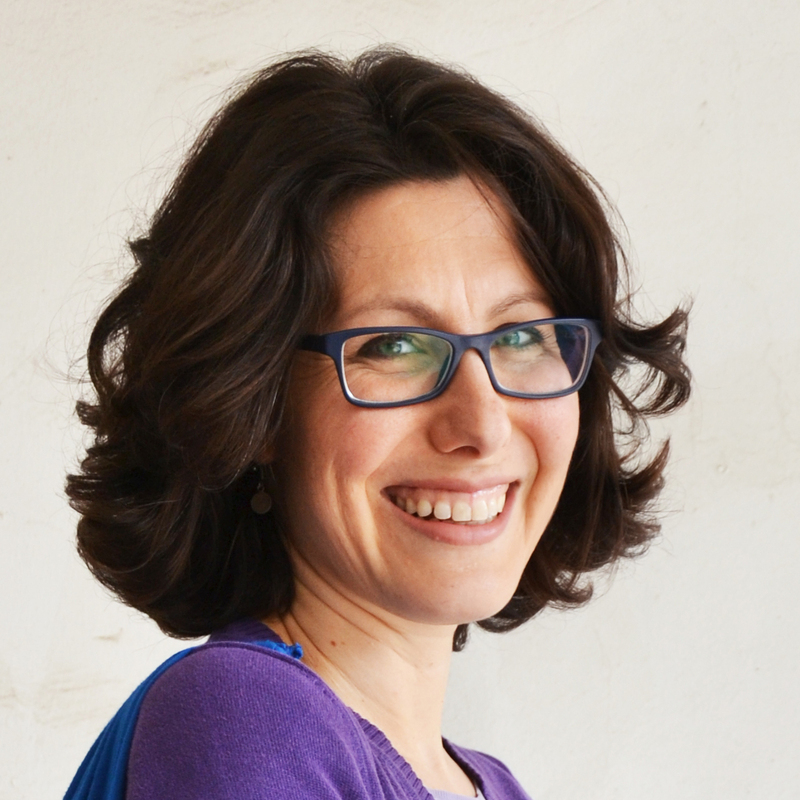 In the years that I’ve been writing this blog, I’ve collaborated with lots of other blogs and websites. 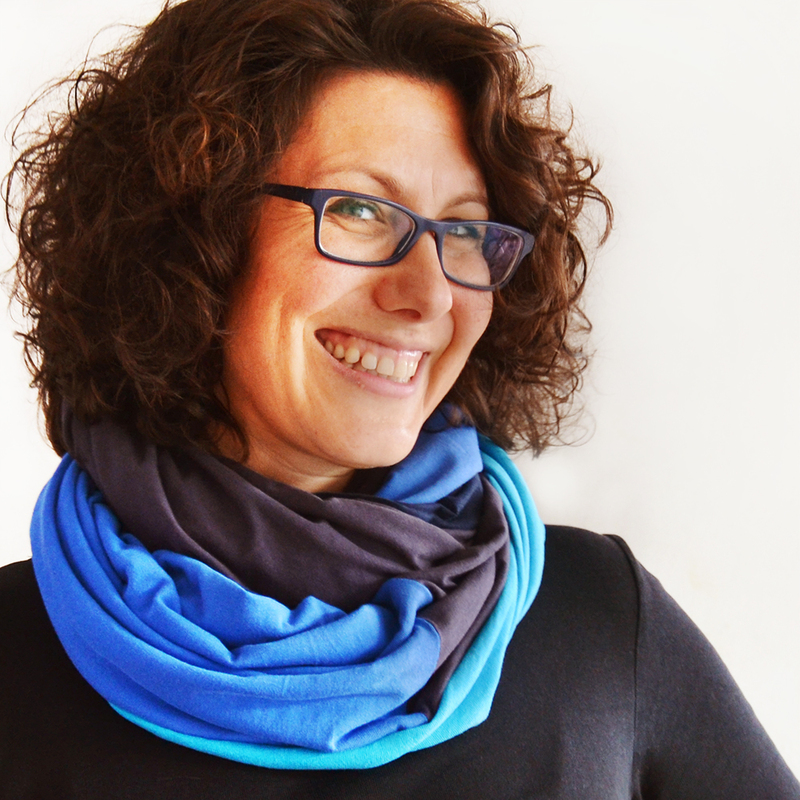 And today I’m so pleased to announce that I’m starting a new collaboration with the Italian handmade learning website Make It Land! 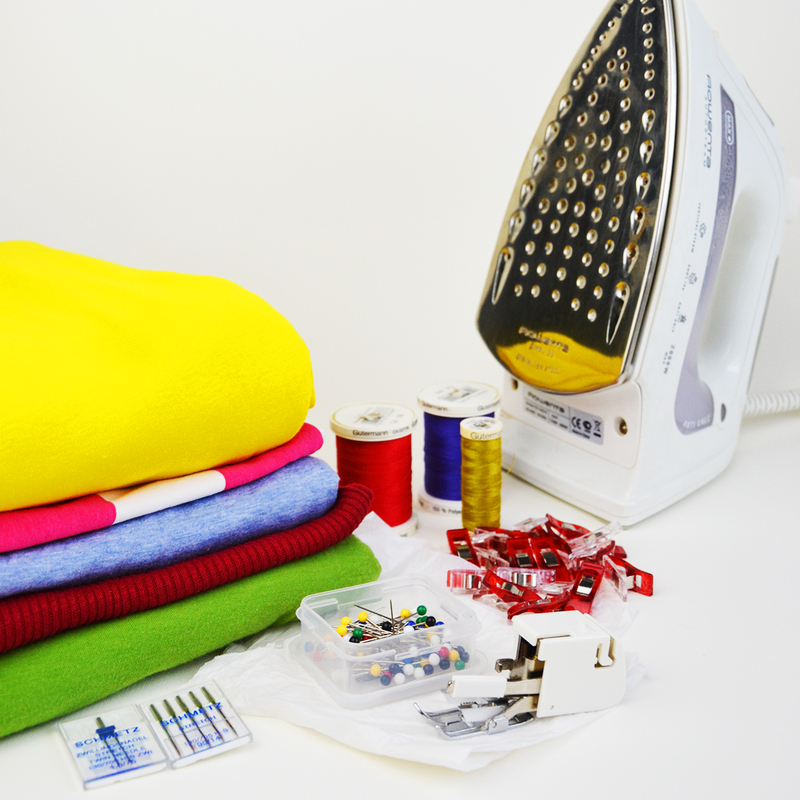 I will contribute an eco-friendly refashioning tutorial every month for my special column of sorts called “Refashion Cafè” and, seeing as the website is only in Italian, I will publish the tutorial in English here on Cucicucicoo for everyone to enjoy! 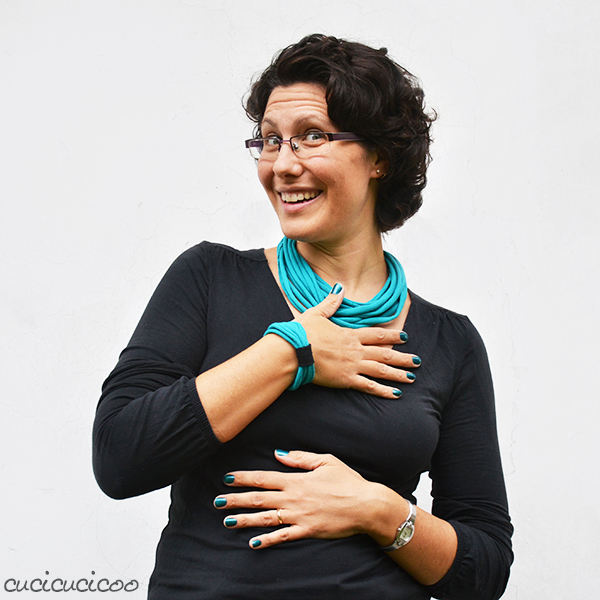 I decided to start off with a very simple refashion that anybody can do, even if she doesn’t know how to sew, crochet or do any other sort of handmade crafting: no-sew T-shirt bracelets! 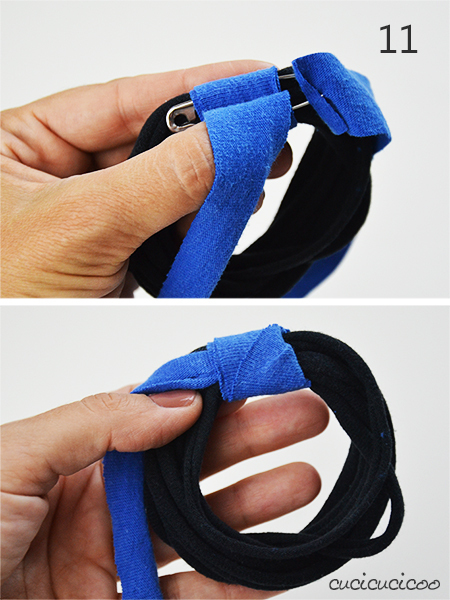 The idea is pretty similar to the no-sew t-shirt sleeve necklace tutorial that I published a few years ago, except it uses a different part of the t-shirt and I’ve figured out a better way to bind all the strips together. 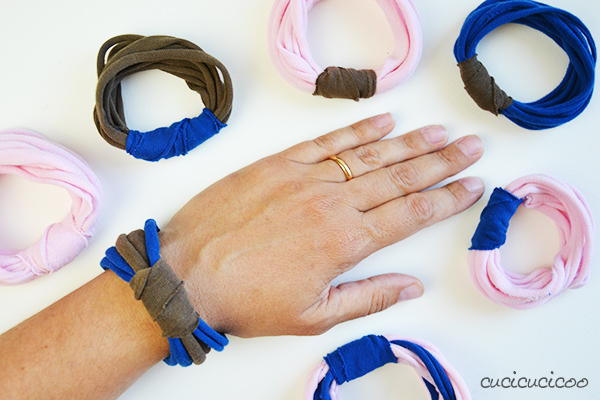 These bracelets are ridiculously easy to make and it’ll take you about two minutes to make one, but they’re still really cute, especially when you make them colorful and with matching necklaces! 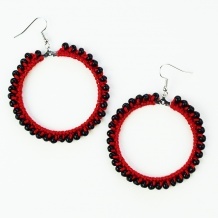 I love wearing these in the summer because they’re light and don’t stick to my skin like most other accessories. They’re also a great gift and, because you just use old t-shirts and they’re so fast to make, you can whip some up for all of your friends! Want to find out how? Then keep on reading for the t-shirt bracelets tutorial! 1. 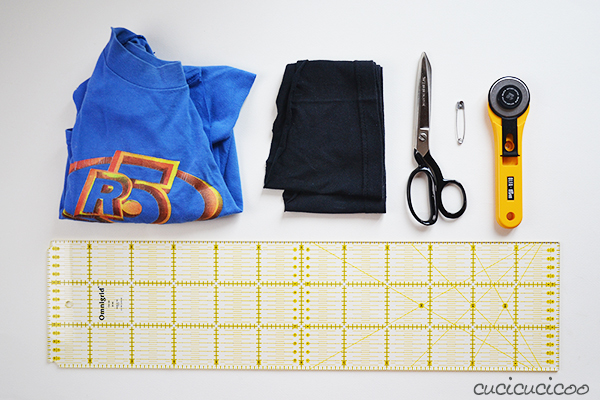 Lay out the main color t-shirt and smooth out any wrinkles. 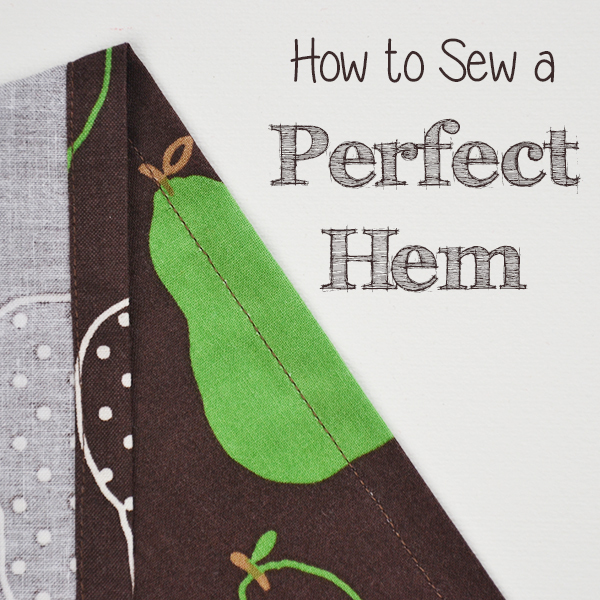 Use the rotary cutter or fabric shears to cut off the bottom hem. As you can see, you don’t need the whole shirt, just a small strip from the torso. Here I’m using a scrap left over from a girlified t-shirt. 2. Measure about 2 cm from cut made in step 1. You can eyeball it, but it looks nicer if it’s an even cut. 3. 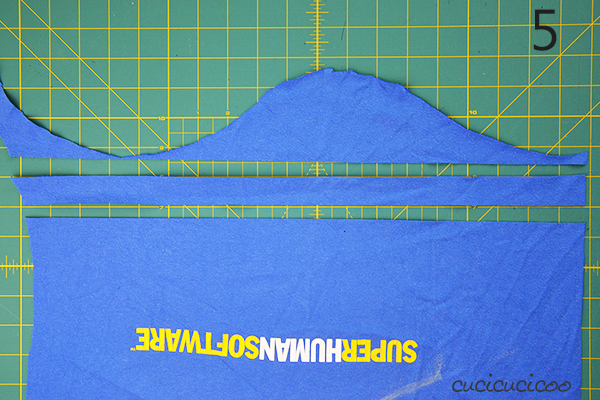 Cut across the torso, making a 2 cm-wide strip. 4. 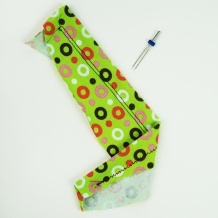 Open up the strip and gently tug on the two ends to stretch it out. 5. Lay out the contrast color t-shirt and smooth out any wrinkles. 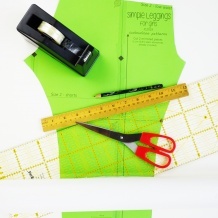 Use the rotary cutter or fabric shears to cut a strip 2 cm wide and roughly 20 cm long. 6. 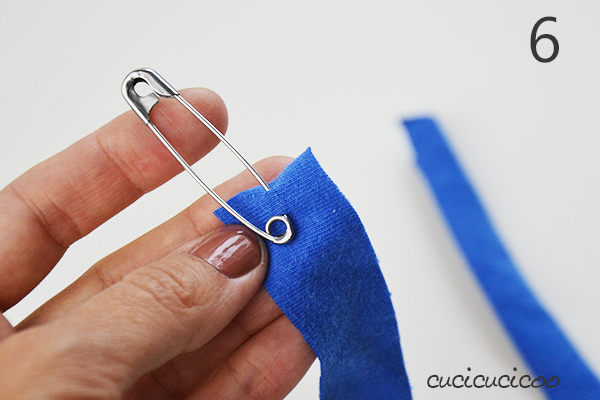 Stick the safety pin into one end of the contrast strip. 7. 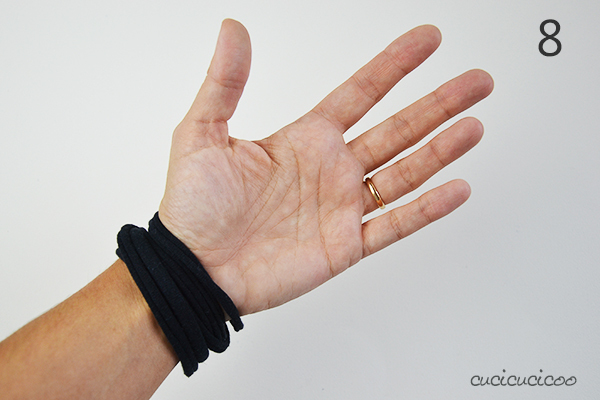 Start wrapping and looping the stretched-out main color t-shirt strip around your wrist. 8. 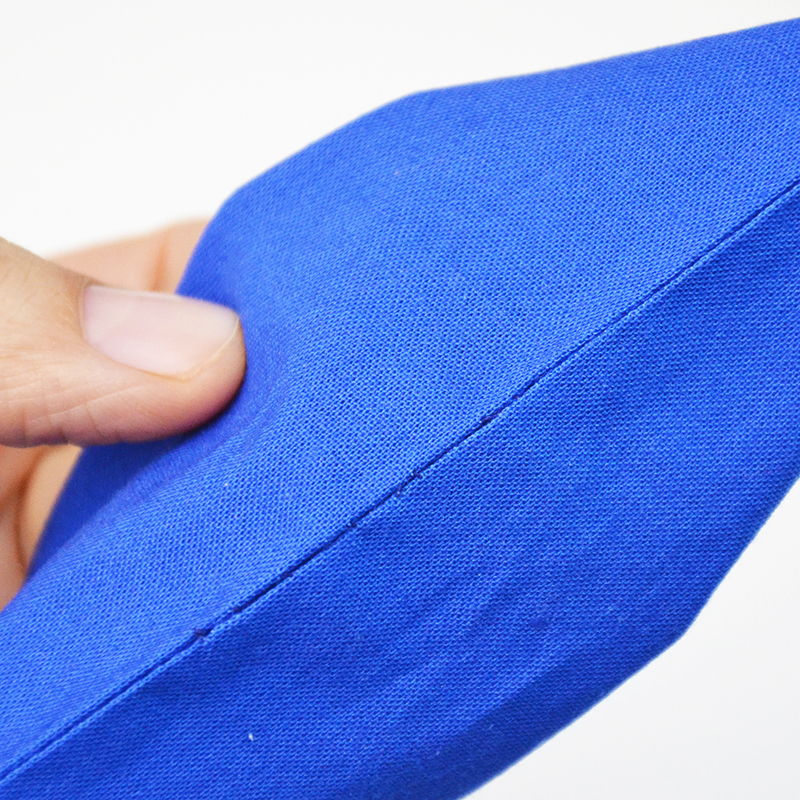 Continue as many times as feels comfortable until the whole strip is wrapped around. It should be somewhat snug, but loose enough to be able to slip it over the hand. 9. Slip the fingers of your other hand (or a helper’s hand, as you see here!) under the loops and pull gently to even out the loops. 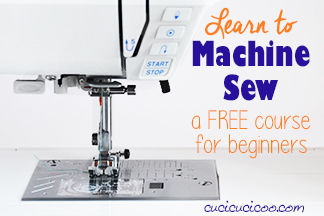 This is to make sure that there aren’t any loops that are tighter or looser than others. 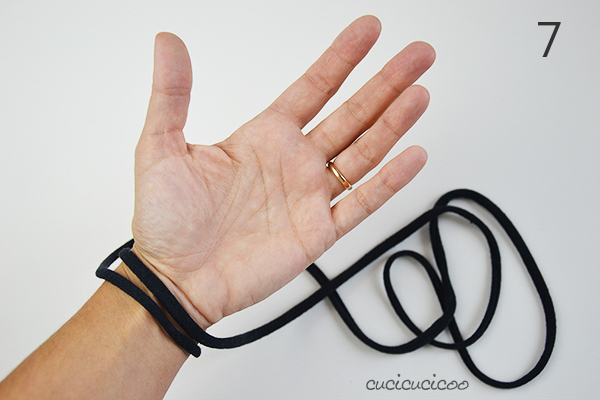 Remove the loops from your hand. 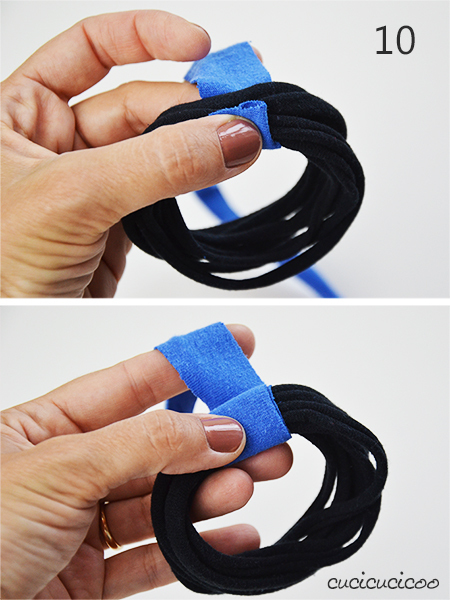 Wrap the contrast strip around and around the loops to hold them in place. 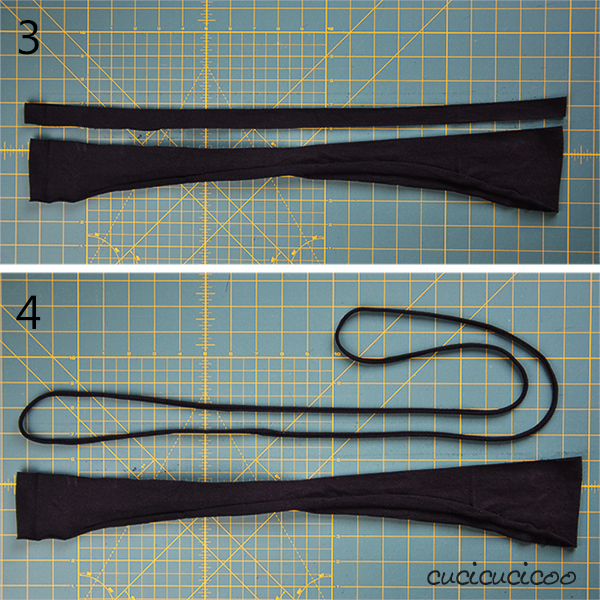 (bottom) I prefer the look of wrapping around the same place as opposed to making a wider binding as seen in the t-shirt sleeve necklace tutorial. 11. When the binding is tight enough to hold the strips in place, slip the safety pin underneath the contrast binding (top), and pull it out on the other side, pulling gently (bottom). 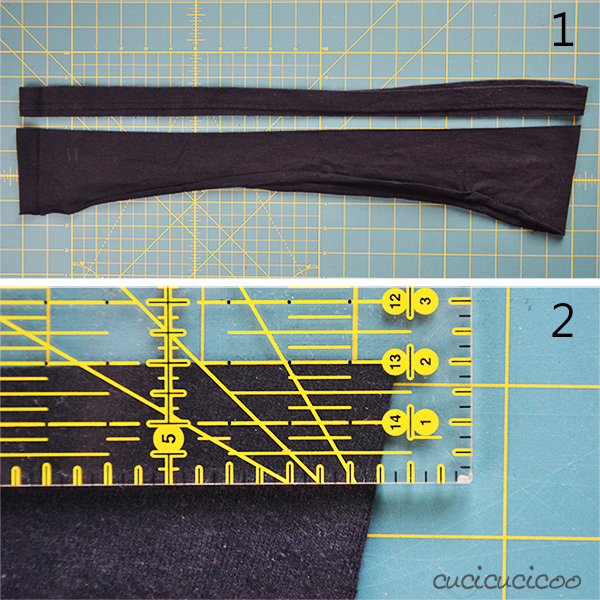 Trim off the end of the contrast binding strip and you’re done! 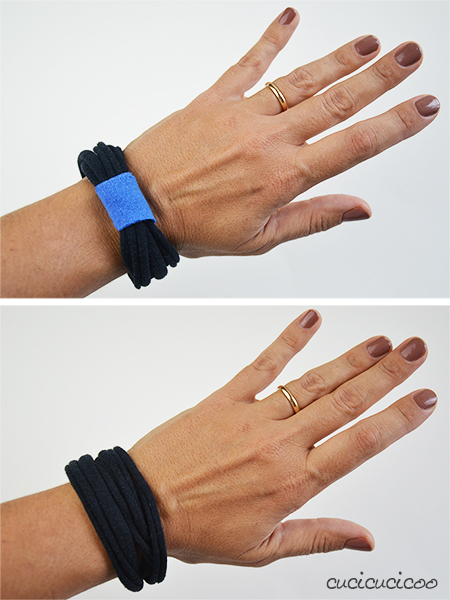 You can wear your bracelet with the contrast strip showing or not… it’s totally up to you! 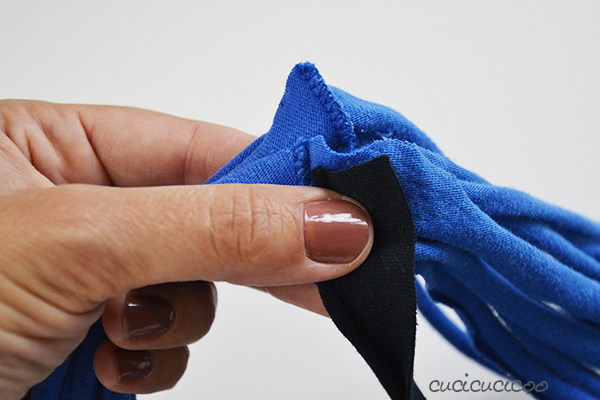 If your t-shirt has seams, like the one above, line them up in one spot and wrap the contrast strip around them to hide them. It takes much longer to explain how to make these little bracelets than to actually make them! 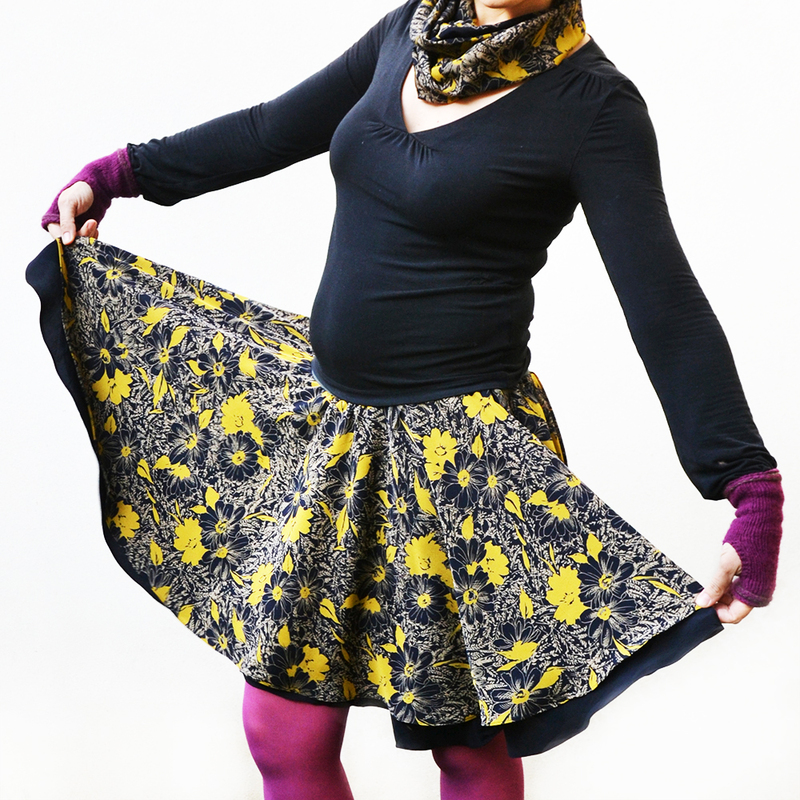 And they use so little fabric, you can make one to match each of your outfits… and even your nail polish! 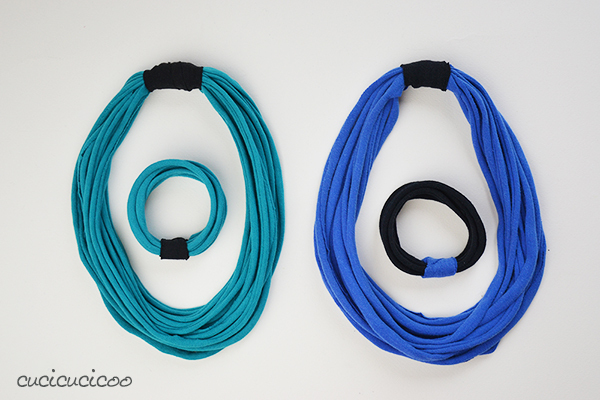 You could even snazz things up and use more than one color for the loops, or use just one color for both the loops and the binding strip. These are the first bracelets that I made this way, but with a different binding method. I prefer the cleaner look of the binding wound in just one spot, not the wide binding shown here, but you can do whatever you prefer! Isn’t that just so, so easy? 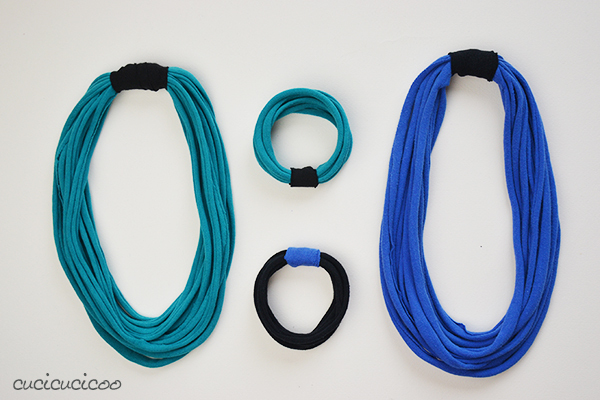 I made some t-shirt bracelet and necklace sets for friends, using the two t-shirt sleeves for the necklace and a strip from the bottom of the shirt for the bracelet. These are great gifts! 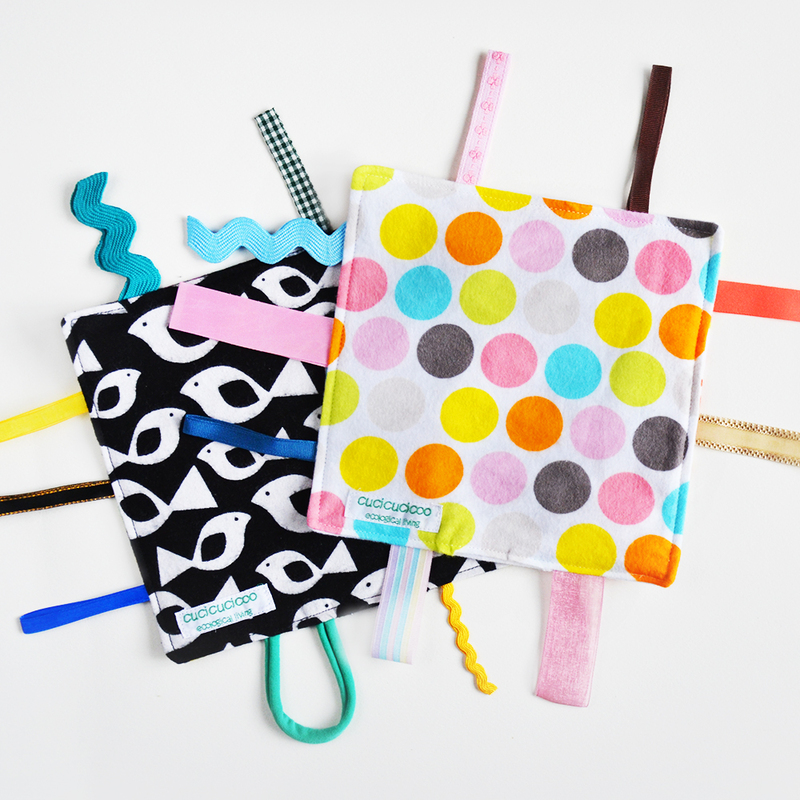 Now brace yourself for the onslaught of compliments that you’ll get on your fun and funky colorful accessories! 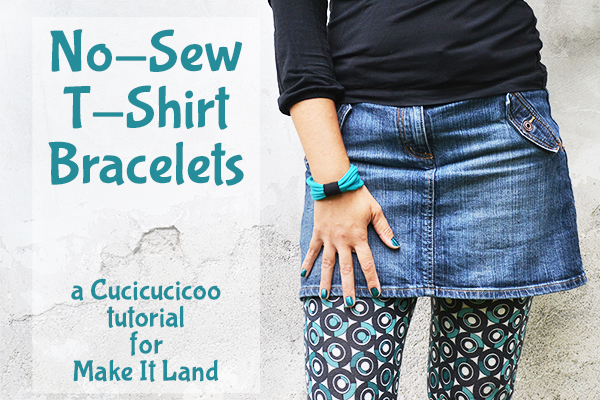 If you liked this T-shirt bracelets tutorial, make sure to check out my beaded T-shirt necklace DIY!